Key considerations before refurbishing your office space. Whether you’ve outgrown your current office space, need to present a more appropriate and professional image to clients or want to improve overall staff morale and productivity, an office fit out is your chance to make a fresh start and cease an opportunity to give your business the perfect setting in which to thrive. Ask yourself if a complete office refurbishment is totally necessary. Firstly, its a huge financial commitment so the responsibility of making that money work is paramount. Secondly, will the process have an impact on business and cause interruption that will hamper your ability to operate as normal. Always have plans in place that allow for your staff and senior management to be able to continue their work with minimal disruption. If this is possible and the investment is one your business knows it must make, then you are ready to think about moving forward. Just like any construction or internal refurbishment project, an office fit out needs to have an internal team to oversee and liaise with the contractors. Without one, you risk the possibility of scope creep and a poor end result occurring due to a lack of oversight and direction. 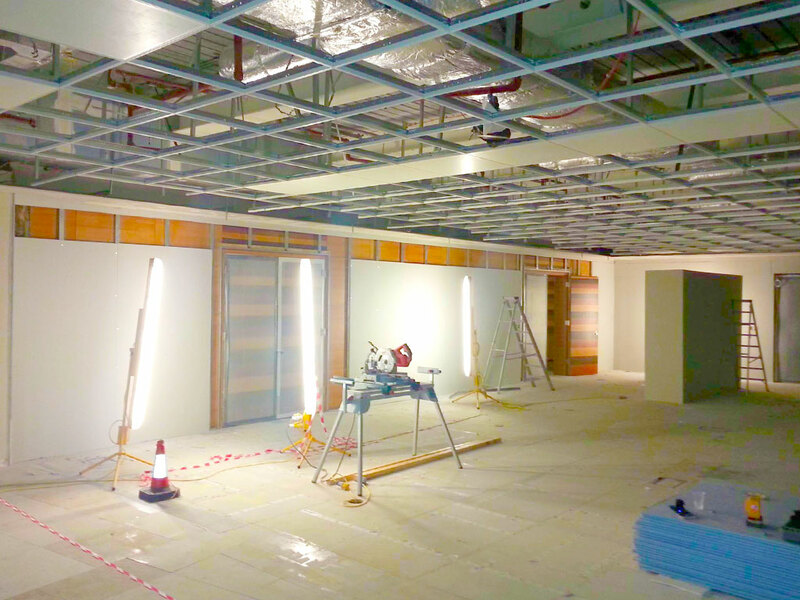 Office refitting is a hugely complex process and require someone with a complete understanding of why your business has decided to take this step and what needs to be implemented to make it work. The biggest mistakes businesses make is assuming the contractors will think of everything because inevitably, they won’t. Never leave key decisions down to assumption. By having a project lead on the ground at key times will ensure the contractors have a point of contact to refer to and ultimately, will know who’s in charge and who’s the one to make the necessary decisions about the fit out specification right from the minutest of details to the final finish. Before a contractor even enters your premises, you need to ensure that you have considered all aspects of the refit and what is needed. Firstly, understand why the fit out is taking place. Has the team outgrown the usable space, is stock and equipment taking over, is noise and interruption spilling over into differing departments? Understanding the needs of each and everyone in the office will give you far greater clarity when it comes to space planning with your fit out contractors. Some teams may need to work in closer proximity whilst others may need separation with less noise and interruption to carry out their tasks. Perhaps your team needs a break out area for meetings and last minute team briefings or perhaps, there’s nowhere for the team to take five minutes for a break or snack? By knowing how your team operates and what their daily working lives entail will give you a far better basis to work from and guarantee, any planned fit out will be a success rather than an expensive failure. Your choice of contractor will naturally have a massive impact on the final outcome. If you’re struggling to decide which contractor to use, weigh up the pros and cons of those you have shortlisted. Have they visited your premises to get a full understanding of your predicament and what needs changing to make your office space work better for you? Did they present ideas that you feel displays a understanding of what you want to achieve? Does their portfolio stack up? Do the costs work for your budget? Do you feel you can work with them? It’s very easy to simply get hung up on cost and delivery times alone, when so many other factors will determine whether the end result works or not. Choose a contractor that can take the strain and oversee all aspects of the project from design, to construction, to electrical and mechanical and even bespoke joinery if necessary; then report directly to you. By using one contractor who displays a high degree of competence will allow you to continue with your daily responsibilities and not have to be continually micromanaging their work and progress. The important thing to remember is that an office fit out is about both style and function. It’s no good having a well designed floor plan in a space that lacks any colour, imagination or finish to inspire and lift your team’s morale. An office refit is your chance to enhance your brand identity, add a splash of colour and deliver a look that is unique to you that your team will enjoy being a part of. It is also about making the space work for you and your team to improve their daily tasks. So ensure you speak to the key figures of each department in your business and discover what could make their daily tasks easier and more efficient through a better understanding of their needs. It could be anything as simple as good storage space or archiving. Access to stock and materials. Noise reduction from heavy traffic areas or being integrated better into a team more closely. All of these factors are important. So discuss and observe how the business currently works and how it could be made to work better through smart use of design principles. Make sure you get input from the key players within your business. This shows that you listen to them, consider their opinions and will thus, boost overall morale. Ask them to have their own departmental meetings about their wishes and issues within the current office setting and then have the key contacts convey those thoughts back to you. Never try to please everyone by having the entire staff direct and vent their frustrations at you in an open forum. That’s just asking for trouble and it will end up becoming a minefield of problems to solve. Remember, you can’t please all the people all at once but, you can at least tackle the bigger issues which should appease a large proportion of the team, making the smaller issues less of a problem in the long term. Once you’re ready to get going with the refit, your biggest headache is where to put your team in the interim period. Never easy if you’re refitting your existing space. If you’re simply moving from one space to another, this is just a simple matter of hiring a highly respected removals firm and making sure everything goes where its meant to. But if you’re refitting your current office, you need to plan for where the team will go and how they can continue working without any loss of performance. In the age of technology and high speed communications, remote working is a very plausible option. If you have a team that you fully trust and know will maintain a high level of professionalism off site, allowing them to work remotely from home or another location is the ideal solution. It means they can take their work to somewhere they are comfortable yet can be reached when you need them. It means they will not have to suffer the constant noise and interruptions an office refit will inevitable bring. If remote working is not an option, look into finding incubator offices or rooms in your present building that could be used on a temporary basis. You could even set up a hotdesking solution for members of the team who are part-time so that a select few members of staff share the same desk at separate times; thus saving the need for extra desks which frees up more space. Whatever you decide to do, make sure you have a suitabel solution in place and ready to go before the fit out takes place.